These are some of my favourites from the latest shipment of Kokka. 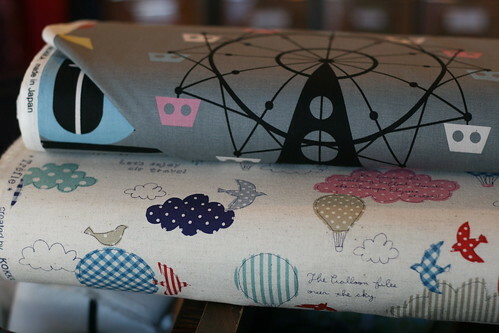 They are a mix of 100% cotton and cotton linen blend prints. There were also a few more Far, Far Away/Heather Ross bolts, a sewing themed (dressforms!) large scale print and some more super cute novelty prints that Kokka does so well. *I know many of our customers are also knit, etc., and while I'm not one of them, I do enjoy visiting our neighbors at Close Knit and their blog. Sally, Leah and Nancy are doing a wonderful job of posting free patterns and product reviews. If you are unable to make it into the store, this is the next best place to park it. (Mom, do you see this scarf? I love it.) They are also moving some of their classes down the road to Modern Domestic! Check MD's website for the list. *The main Bolt Neighborhood Fabric Boutique website has been redesigned! You'll find new pictures of the store, maps to finding us, and other useful information. Gina is coming up on five years in business and will be celebrating something big next month. Sign up for our newsletter on the main site, and get advance notice on what's in store. *For those of you with plotting out Halloween wardrobes, just a reminder that among other things, we stock all kinds of tulle, shiny bits, fleece and velveteen. Not to mention, glow-in-the-dark embroidery thread and Jaquard textile paint (perfect for stenciling Super Hero logos onto pajamas). Sally is also running two classes (the 10th and 17th of October) to help you with any costume conundrums you may be facing. Sewing unfamiliar fabric on MD's beautiful machines could very possibly be like sewing with magic.